FAYETTEVILLE, Ark. – Following an 18-day break from competition, the No. 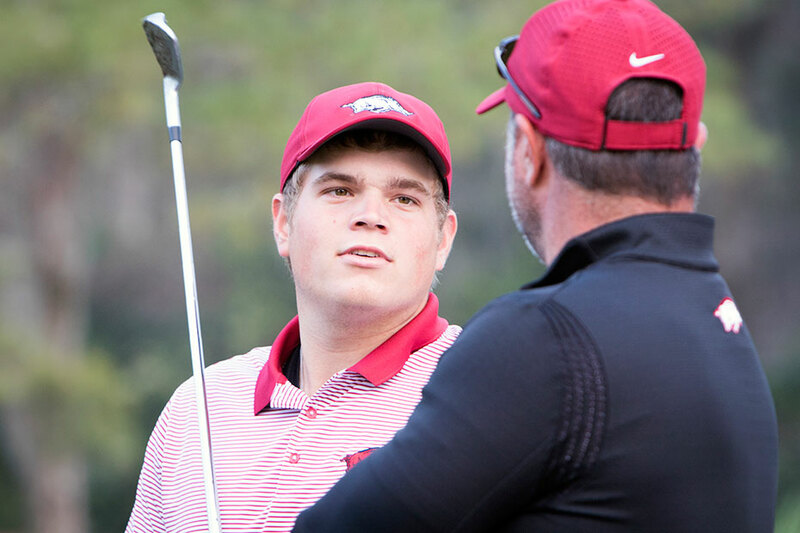 16 Arkansas men’s golf team returns to the links this weekend, traveling to Bryan, Texas, to compete in the Aggie Invitational for the sixth consecutive season. The Razorbacks continue to play one of the toughest schedules in the country, facing five of the top 10 teams in the nation, including top-ranked Oklahoma State and No. 2 Texas A&M on its home course. The 54-hole event will be played at the Jack Nicklaus designed Traditions Club, a par 72, 7,146-yard course that opened in 2004. Teams will play 36 holes on Saturday, April 7, before coming back for 18 holes on Sunday, April 8. Live scoring is available at Golfstat.com or via the Golfstat Live app. The Razorbacks return to the always-tough Aggie Invitational for the sixth straight year, having posted top-three finishes at the event twice in the last three years. The 14-team field will serve as the team’s final tune-up before postseason play. Alvaro Ortiz leads the team with a 70.1 stroke average, while Mason Overstreet is right on his heels at 70.4 The duo has combined to shoot 33-under par on the year. Luis Garza is third on the team in stroke average and joins Ortiz and Overstreet as individual winners this season. Arkansas enters the final tournament of the regular season with a 94-34-2 overall head-to-head record, including a 49-23-2 mark during the spring campaign. The Razorbacks have multiple team victories for the sixth time in the last eight years and are looking for a third title for the first time in six seasons. Live scoring will be available at Golfstat.com or via the Golfstat Live app.